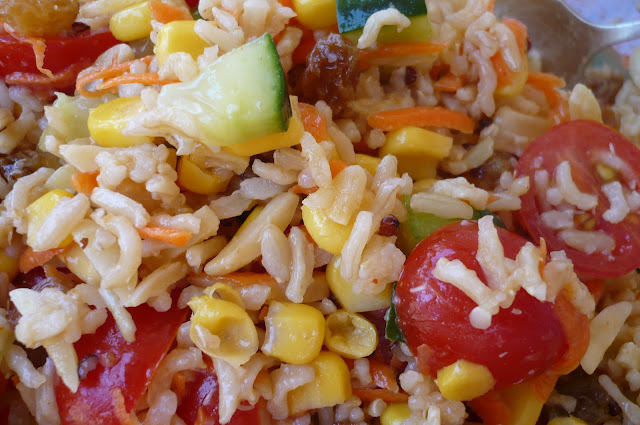 over the summer is rice salad. It is so quick and easy not to mention delicious! It's a great way to use up salad vegetables and everyone loves it! 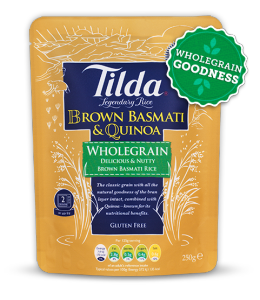 One packet of Tilda brown basmati rice and quinoa. You may of course use your own brown rice but this stuff is amazing! Follow the directions on the packet. While the rice is cooling chop your vegetables. a handful of sultanas and a some pinenuts or flaked almonds. A small can of sweet corn adds more colour. a teaspoon of minced garlic and about a 1/4 cup sweet chilli sauce. Mix your dressing through your rice salad. Don't worry though all the crunchy bits stay crunchy! a sponsored post for Tilda rice , I just really do love it! Hmm rice salad... Looks yummy and a different recipe. I never have heard of rice in the salad before. Though i like rice but i personally feel if you are on dieting then you should avoid this salad.